What amazing things you create! These are adorable. About how many paper circles did it take to cover the ball? Getting ideas for Christmas projects for my class. Well it depends on the size of the foam ball that you are using as the base and also the size of the circles that you will be using. I suppose I used about 50 circles for each of the pinecones that are in the pictures, but it is tough to give an accurate estimate. This would be a wonderful project to do with your class though, great idea! These ornaments are so beautiful! They look expensive but are easy to make! 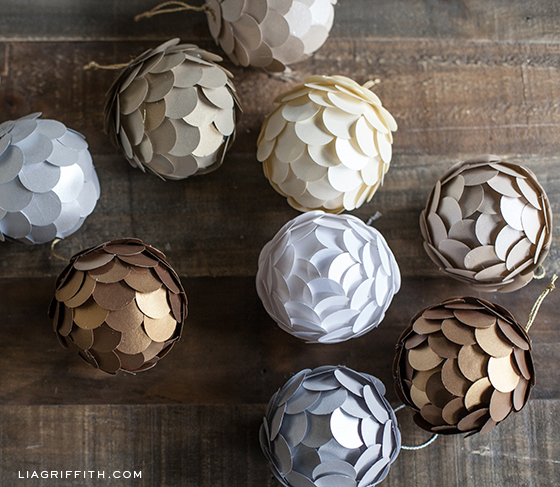 I’ve featured them on my blog as part of a DIY Christmas tree ornament roundup here if you’d like to take a look. Merry Christmas! I put the loop of twine thru a hole in the first circle. then a tiny straight pin in the knot and a little glue; then pushed the pin into the styrofoam ball. Worked great for hanging on the tree. Thanks for lovely ornament and your blog. 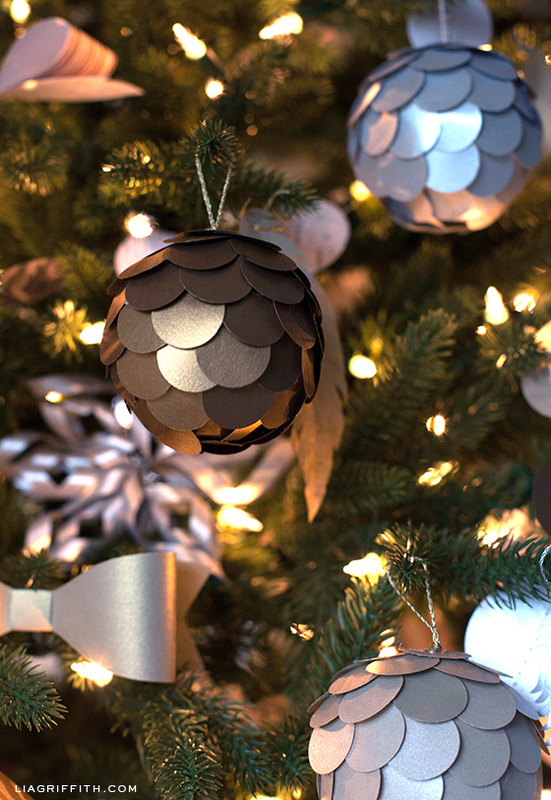 Your metallic ball ornaments are beautiful!! 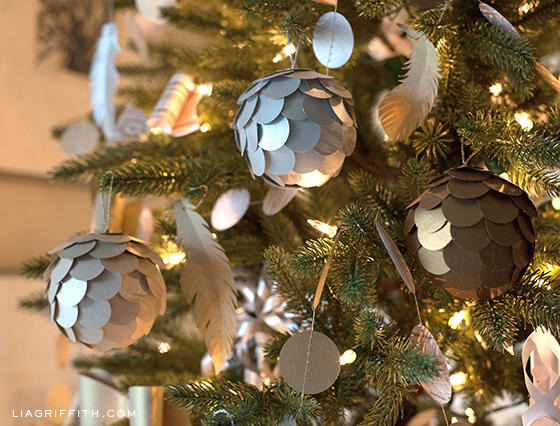 I want to make these too, thanks for the tutorial and I’ve given them a little mention in my paper ornaments post too today – Happy Holidays! Thanks Heather! Love your blog. Love this Christmas ornament. Not only is it very elegant, but incredibly simple. A lot of look for so little work. Thanks for sharing it. Been making modern shabby chic ornaments for my tree. These would be a great addition in pale pink s and whites. Those colors would look so pretty. Share photos! You know, I initially started from the bottom too but my niece who was helping me did it the other direction and I found it was easier to keep the pieces uniform her way. So I say either way works. Best wishes to everyone for a magical holiday season! These are really beautiful and clever. I’m so thrilled I found your blog! Just knew you’d still have more wonderful decorations for us to make. The balls with one inch circles are so gorgeous and I happen to have some foam balls, not size you used and I also have some gorgeous coppery paper and some kraft paper with gold stars on it. Got the kraft paper at $tree and have 2 rolls of it. 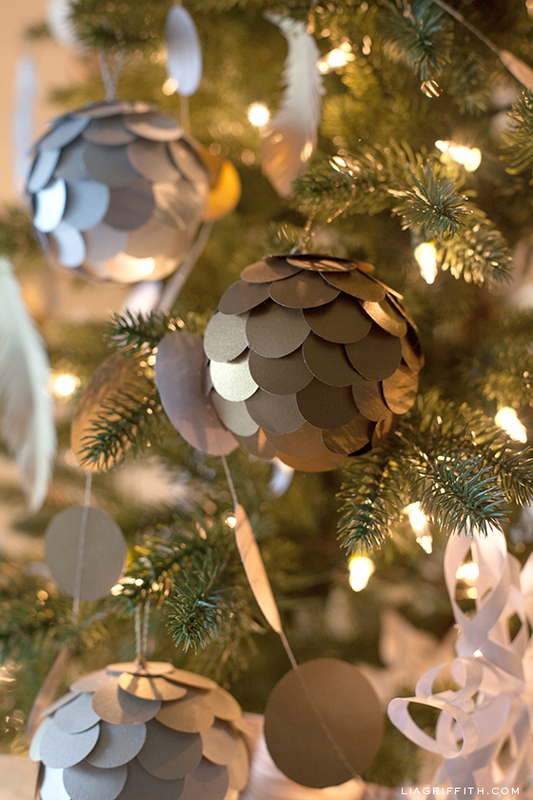 Lia those metallic balls are just so cute, I am going to try a few with my grandson so we could hang them on my tree. Great idea, Thank you lots. Yes! You can use a warm temp glue gun so he can get right in there and help you.